How can renewable energy meet modern power demands? ECI is participating with Fuinneamh (CFOAT) in the Seafuel Interreg research project assessing uses of Hydrogen in island communities as a transport fuel. Partners at the conference had the opportunity to discuss the progress of the project and attend the open-workshop “Hydrogen for transport” organized by AREAM. On March 14th – 15th representatives of SEAFUEL project’s partner organizations met in Funchal, Madeira, in order to attend the 3rd Project Meeting and a workshop with stakeholders on hydrogen for transport. The meeting and the event, hosted by the Regional Agency for Energy and Environment of the Autonomous Region of Madeira (AREAM), took place in Madeira Institute of Wine, Embroidery and Crafts in Funchal. During the first day of the meeting, partners addressed the implementation of activities and had the opportunity to discuss and plan the methodology of coming activities in the project work plan. On the second day, partners attended the stakeholders’ events “Hydrogen for transports” organized by AREAM at the Madeira Institute of Wine, Embroidery and Crafts (Instituto do Vinho, Bordado e Artesanato da Madeira – IVBM) within the frame of the second-day meeting session. 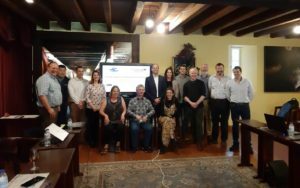 The workshop, which started with a presentation of SEAFUEL project, included the participation of the companies Caetano Bus and Aquartera, and the European Center for Marine Energy (EMEC) that presented their vision on the use of hydrogen in transport, with an essential focus on land and sea transport. With a total budget of € 3,5 million, SEAFUEL project aims to use the renewable resources of the Atlantic Area to power the local transport fleet, thus supporting the shift towards a low carbon economy (LCE). It will be tested in the Canary Islands, Madeira and the Aran Islands and will use the experience and infrastructure of the partners in the field of renewable energies, namely solar, wind and marine, to demonstrate the viability of hydrogen as a fuel to be used by the local transport authorities. This entry was posted in Co-ops News, Events, Featured News, Research, Technology News. Bookmark the permalink.